It’s hard enough to stay fresh traveling short distances. But what about when you’re an international traveler, stuck on a hot plane between two other exhausted travelers fighting for your arm rest? As a frequent traveler to remote locations, I often find myself on 40+ hour itineraries with many connections and too-short layovers that leave me sprinting through airports to catch the next plane to who-knows-where. The result? A sweaty, tired traveler in a confined space. Not idea. This is a problem for every long-haul traveler. Maybe there’s an important meeting just after landing, you’re meeting someone at the airport, or you’re just tired and smelly and want to freshen up. But how? 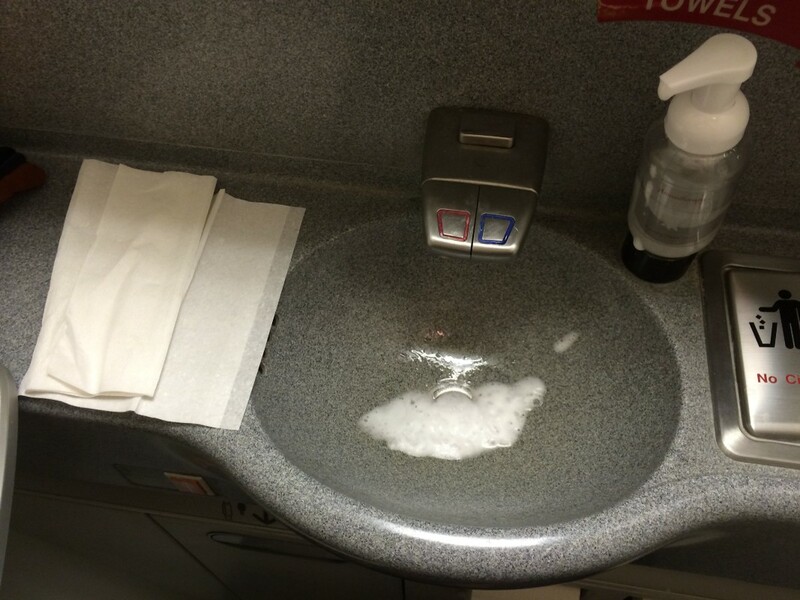 Over the years, I’ve developed a method for taking a nice, refreshing shower mid-flight. It’s not the most luxurious spa treatment you’ll ever experience, but it’s welcome relief from the rigors of travel and—most importantly—will leave you clean and confident you’re not offending the surrounding three rows of passengers. I documented the process on my three-day journey home from Antarctica. Here’s how it works. I only wish I could have taught this to the smelly guy two rows ahead of me on my JFK-SFO connection the other day. A change of clothes — Shirt, underwear, and socks. 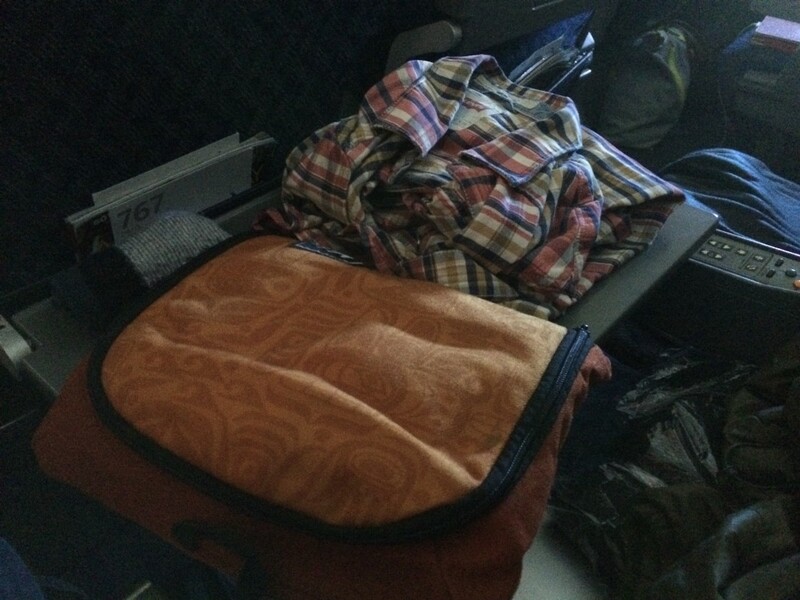 No need to crowd your carry-on with pants; they don’t get smelly. Small, plastic garbage bag — you’re going to store your dirty clothes in this. Very important! Toothbrush & toothpaste —Your mouth can get pretty funky when you’re traveling for 48 hours. If you’re flying through the U.S. (land of the stupidest carry-on restrictions), be sure your toothpaste is under 3 oz or you’ll lose it at security. Deodorant — Even if you don’t normally need it, you probably do for extra-long-haul travel. Optional: Small, absorbent towel — For drying yourself off efficiently. If you forget or don’t have one, you can use the paper towels in the restroom, but it’s not so fast or eco-friendly. You’re sitting in your tiny economy seat trying to get the last bit of salty dust from your free bag of pretzel snacks when you lift your arms to stretch and realize conditions in the armpit region have become untenable. Time for your restroom shower! The best time for this is mid-flight when everyone’s relaxing in their seats or sleeping and you’ll avoid impatient knockers. 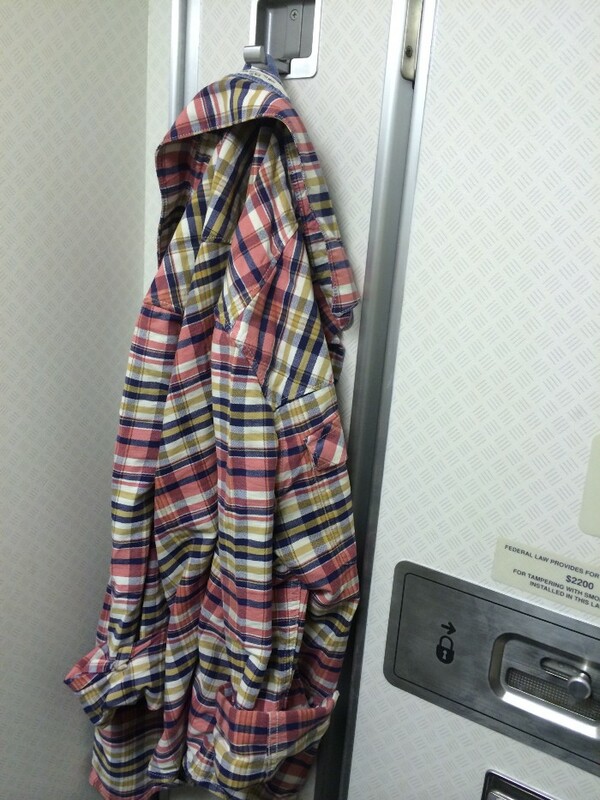 Never take your shower at the end of a long flight. This is when the bathroom will be the dirtiest from over-use. Just after reaching cruising altitude when everyone’s settled in is best. 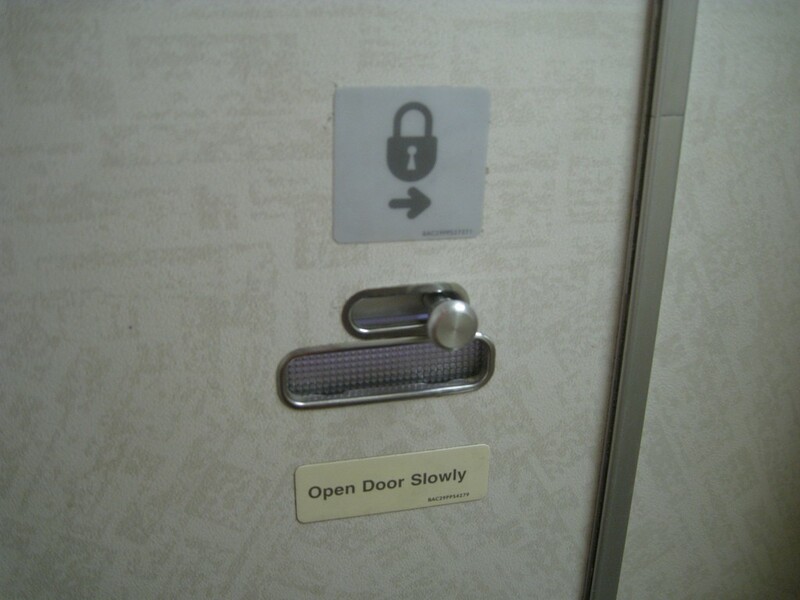 First and foremost, be sure you completely lock the door! Restroom locks slide open and closed. It’s easy not to notice you didn’t slide the lock all the way. An unexpected visitor during your shower would be most unpleasant. Once inside, lower the baby changing station. This is where you’re going to stage your clean clothes and toiletries. If you like, use a wet paper towel and some soap to wash this first. The jacket hanger on the inside of the folding door is also a good place to stage clean clothes. Finally, undress. Leave your dirty clothes on the toilet seat. Don’t put anything you don’t want wet on the floor. If the plane isn’t crowded (ie. low chance of a traffic jam at your restroom) and you don’t mind doing a little extra clean up, you can start your shower by dousing yourself with warm water from the sink, ladling it onto yourself with your hands. This is nice, but optional. If you prefer a quicker shower, skip this. The washing method involves using water from the sink, paper towels, and hand soap. Soak a paper towel in warm water, wring it out, massage a little soap into it, and apply. Pretty simple! You’ll need 2-3 of these to hit the critical “smelly bits” and 5-6 to cover your whole body. Side note: I don’t wash my hair when showering on an airplane as it’s a bit impractical and not critical. Use the towel you brought to dry yourself off, then add it to your dirty clothes pile. Don’t forget to apply deodorant at this stage. Don’t worry about getting water on the floor or walls; you’ll wipe this up next. Now that you’re clean and refreshed, it’s time to finish up. It’s best to dry off the floor and walls of the bathroom with a few paper towels beforegetting dressed. This keeps you from getting your clean clothes wet as you bump into the walls getting dressed. 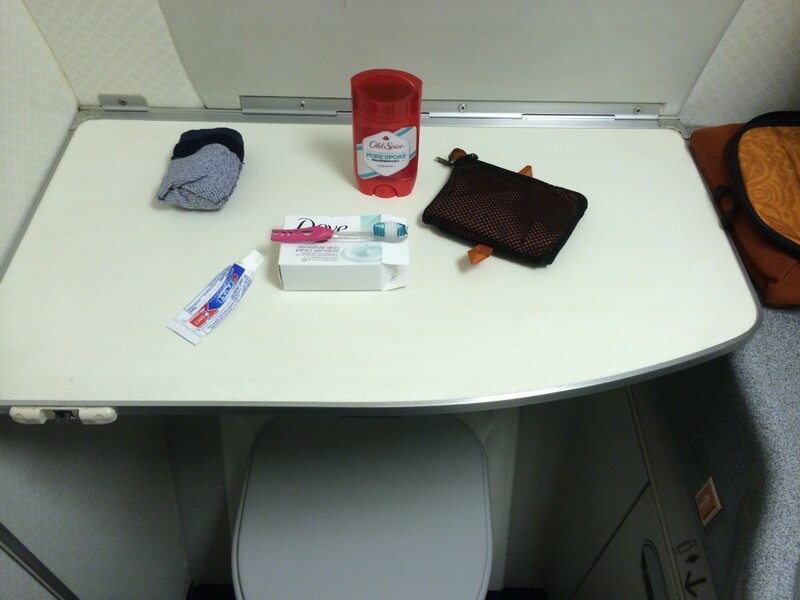 Once the bathroom is dried off and you’re dressed it’s time to brush your teeth, gather your items and head back to your seat. If you prefer not to go barefoot, you can bring your socks, but don’t put them on until you’re out of the bathroom; they’ll get wet. You’re done; enjoy the rest of your flight in comfort! Pro tip: I like to leave my shoes off for the rest of the flight to stay comfortable and give my shoes a chance to air out. If they’re smelly, you can put them in an overhead bin to contain the odor until they’ve aired out.